Little Mix and BTS were the big winners at Sunday’s BBC Radio 1 Teen Awards 2018. The girlband took home best British group while K-pop superstars BTS were awarded with the best international group award – appearing by video link to surprise fans at Wembley Arena. Ed Sheeran won best British solo artist, with Shawn Mendes taking home the international equivalent. This year’s Teen Heroes were celebrated and awarded their prizes on stage. Lily, Siena and Junior were thanked for their “selfless” work. Lily, 14, is a wheelchair motocross competitor who helps children like her access her sport. Siena, 16, works to support students with autism and learning disabilities and Junior, 14, is a UK freestyle dance champion who campaigns against bullying. All three of them were recognised for their outstanding dedication to helping others. 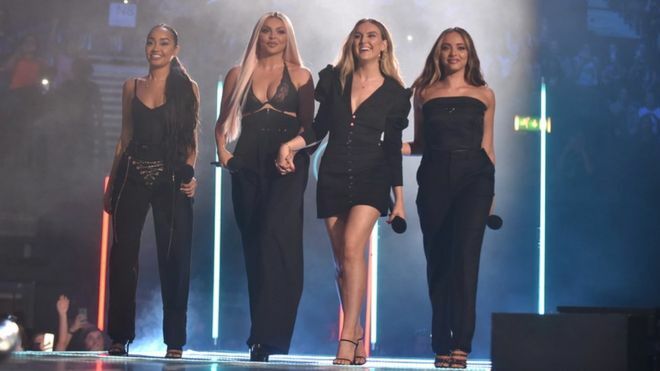 The awards show, which is in its ninth year, also saw performances from the likes of 5 Seconds of Summer, Not3s, Mabel, Little Mix and Jonas Blue featuring Liam Payne. And Gemma Collins – who suffered a viral fall at the 2017 Teen Awards – made a triumphant return. “So much has happened since that moment – that fall has been the absolute making of my career,” Gemma said. Winners are voted for by Radio 1 listeners, who collectively decided Cardi B is this year’s most entertaining celebrity. Last year the award went to Stormzy. Ed Sheeran and Little Mix won in their categories for the second year running, as did Love Island, which was voted the best TV show.